This page contains a strategy guide for the Luncheon Kingdom in Super Mario Odyssey. The guide includes the location for each Power Moons in the kingdom. This page contains a strategy guide on the Luncheon Kingdom found in Super Mario Odyssey. 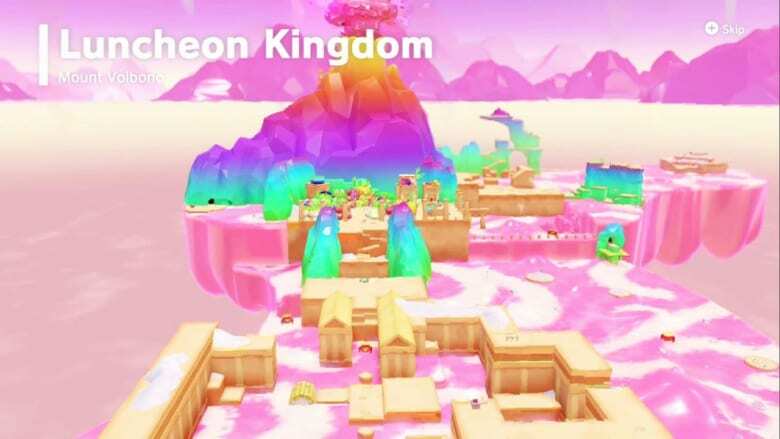 The guide contains walkthroughs for each location in the kingdom, as well as the location for each Power Moon in the area. The Luncheon Kingdom is themed after colorful food, where there are giant colored fruits scattered everywhere. Its has the greater location called Mount Volbano, a volcano which pours out pink lava. Mount Volbano is also where the Volbonans live. Take control of a Lava Bubble and climb up the steps. Click here to go to out detailed guide on how to defeat Spewart. Pass through the plaza and head out to the east. Capture a Lava Bubble. Take it to the point where the magma boils and rises up. Take control of a Hammer bro and destroy the cheese rock above the step. Acquire the power moon that appears after you flip the switch. Take the block of meat on the hill. Twitch in order to break the salt casing. Leave the plateau. You’ll be thrown into the stew. Cross the soup of ingredients to obtain the Grand Moon. Head back to the starting point. Capture a bubble and take a left and take a new cannon to launch yourself across a gap. Climb the steps up to the checkpoint at the entrance to the volcano cave. Cross through the clay pipe and head to the other side. Head to the top of the volcano and drop down the side. Take control of a bubble and climb Magma Falls, then get off. When you reach the final platform, take control of another Lava Bubble to light the unlit torch and obtain a Power Moon. Head out to the entrance of the summit route. You can use the lava platforms if you took control of a Lava Bubble, or use the solid blue platforms if you’re currently controlling Mario. Pass through the summit route checkpoint. Swim into the pot to face Cookatiel. Click here to go to our detailed guide on how to defeat Cookatiel. Mario needs to have 18 Power Moons in the Luncheon Kingdom in order to power up the Odyssey. Under the Cheese Rocks Capture a Hammer Bro and use his frying pans to break a few cheese rocks to reveal a switch that opens a cage which contains a Power Moon. Love Above the Lava Meet the female Goomba while controlling a captured Goomba Stack. Magma Narrow Path Capture a Lava Bubble and overcome a pink lava level challenge in a hidden area. A Strong Simmer Capture a Lava Bubble and heat the first pot in the cooking area. An Extreme Simmer Capture a Lava Bubble and heating the second pot in the cooking area. Is This an Ingredient Too?! Break the crates near the Crazy Cap store then climb to the top of the structure. Golden Turnip Recipe 1 Throw a golden turnip into the cooking pot near the Crazy Cap store. Excavate ‘n’ Search the Cheese Rocks Collect five Moon Shards in a hidden area found right before going to the “Under the Cheese Rocks” Power Moon. Climb the Cheese Rocks Climb the highest cheese rock in a hidden area found right before reaching the “Under the Cheese Rocks” Power Moon. Lurking in the Pillar’s Shadow Found in the first area of the Luncheon Kingdom in a corner between two pillars. Fork Flickin’ to the Summit Capture Volbonans and use their hat spinners to reach the top of a summit in a hidden area. Taking Notes: Swimming in Magma Collect all of the Rainbow Notes above the lava near the Meat Plateau. Beneath the Rolling Vegetables Found at the end of the 2D segment beneath an island where there are large rolling bell peppers. Luncheon Kingdom Timer Challenge 1 Capture a scarecrow near the first area and wall jump up the blocks that appear. Big Pot on the Volcano: Dive In! Use Cappy to capture a slab of meat then let Mario ride Cookatiel to the top of Mount Volbono. We will post where each cap in the area can be found in the kingdom once the game releases. Stay tuned for updates.